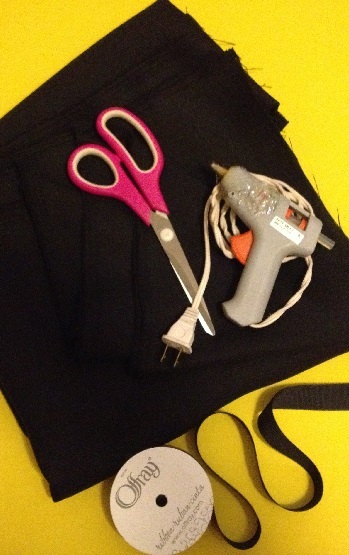 Easy NO-SEW Cape: How to make a cosplay cape for beginners. 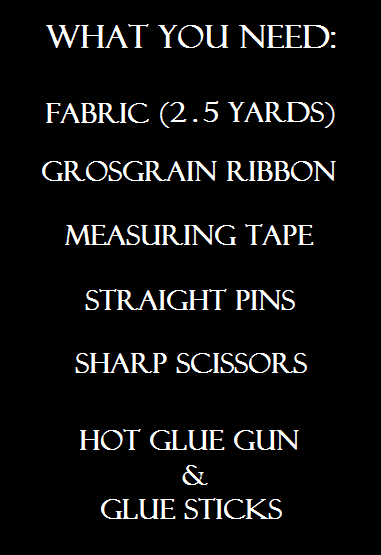 Make sure your ribbon is at least 7/8″ wide. If you want a longer cape measure from the base of your neck to where you want the cape to end to find your “desired length.” (Hehehe. Get your minds out of the gutter ladies.) 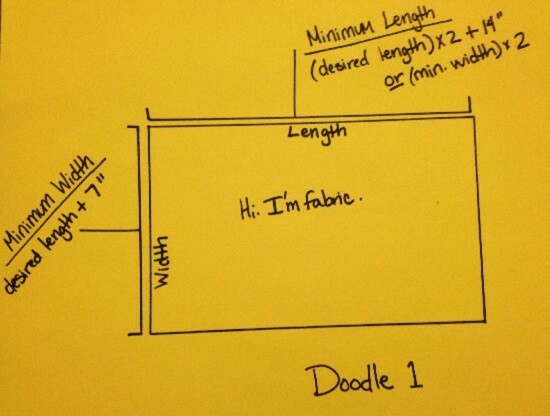 Consult Doodle 1 to calculate fabric size needed. 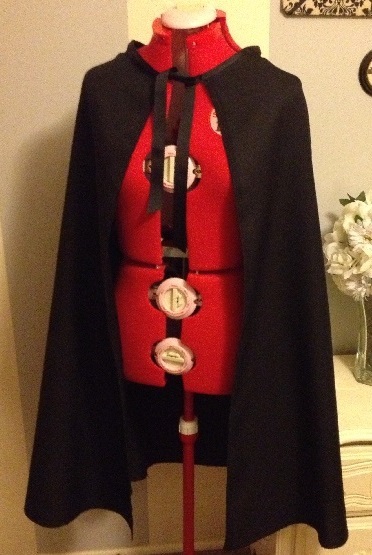 IMPORTANT: Choose a fabric that will not fray because you are not going to be hemming this cape. 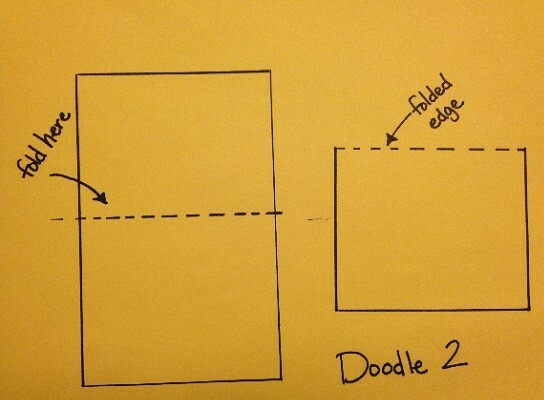 STEP ONE: Unfold your fabric and lay it out flat. Iron out any major wrinkles and/or creases if necessary. Be sure not to pull the corner pin out of place. 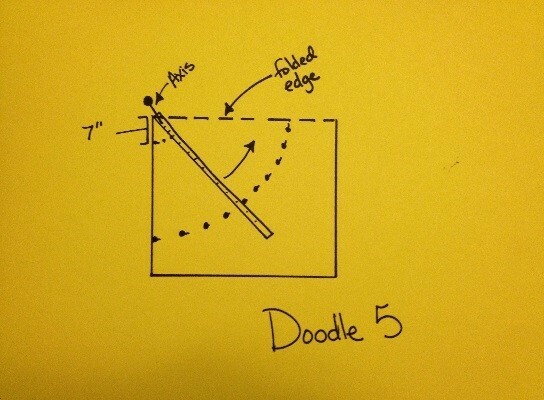 STEP FIVE: Repeat Step 4, placing a pin at 7” each time instead of 45.” (Doodle 5) Then unpin your tape measure. STEP SEVEN: Make sure you remove all the pins and unfold. (Doodle 7) Now you’re in the homestretch! STEP EIGHT: Plug in your glue gun and let it get hot while you measure out apprx. 52” of ribbon. Seriously, it’s no big deal if you go over or under an inch or two. 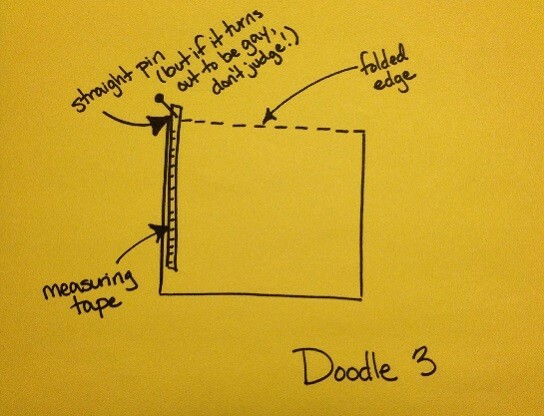 STEP NINE: Measure 15″ of ribbon and mark it with a pin. 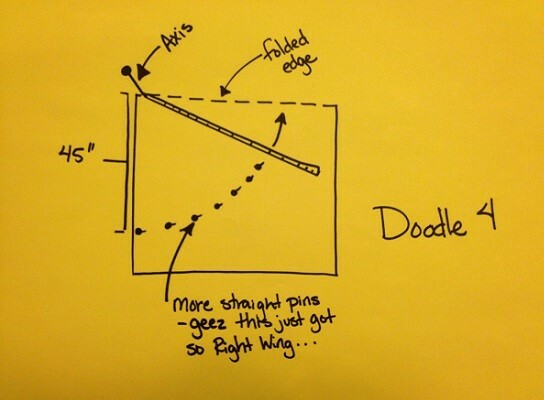 Lay your ribbon flat. 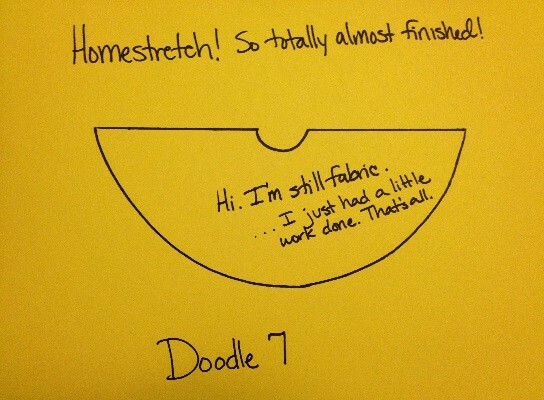 STEP 10: I’ll call the tiny half-circle cut out in Doodle 7 the “neck hole”. 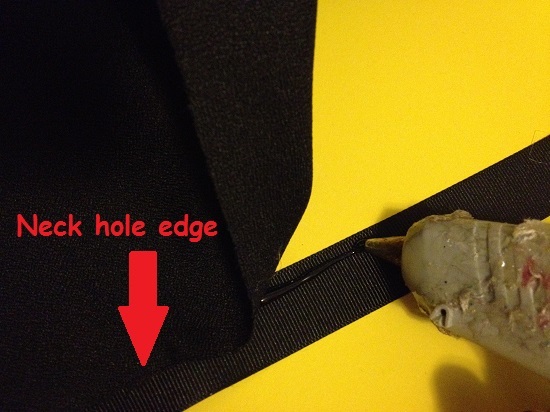 Starting at your pin and the edge of the neck hole, apply hot glue to half the width of the ribbon and attach the edge of the neck hole working in small sections. 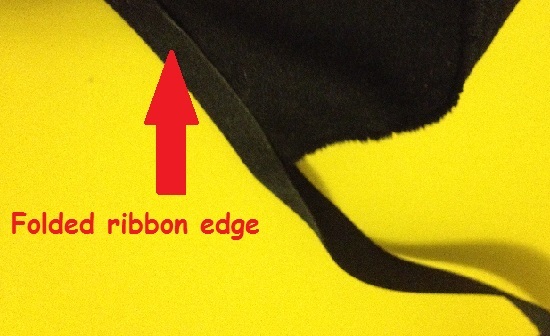 Make sure your neck hole edge is only covering half the ribbon width as shown below. When finished you should have apprx. 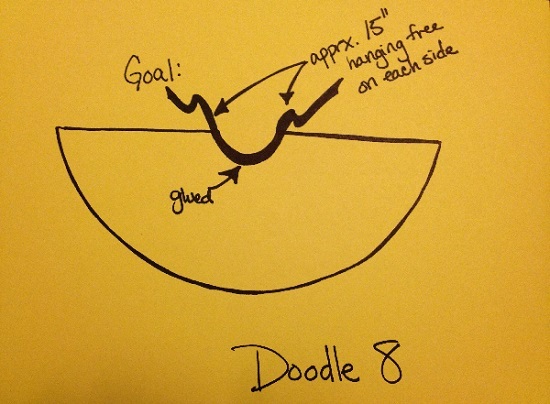 15″ of ribbon hanging loose from either end of the neck hole (Doodle 8). STEP 11: Along the edge of the neck hole, fold the ribbon over so that the edge of the fabric is covered completely. Glue in place. That’s all. Wear it. Look awesome. 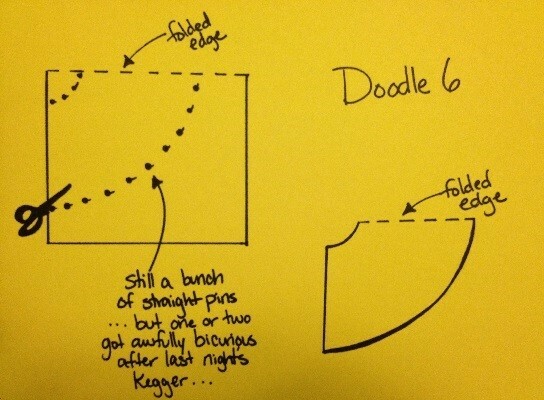 Try not to spill too much booze on it. Mission accomplished. Next Taking Pictures is Hard You Guys!